McConomy, Palmer, Thompsett, Thorpe, Jay, Griffin, Hicks, Acaster, Hancock, Herlihy, Bruce, Wright and Clark, perhaps not in that order, are among Jaguar Land Rover people sharing Discovery’s Scottish Car of the Year (SCOTY) title. Sixth from left is Stephen Park of the Association of Scottish Motoring Writers (ASMW) that made the award. It was a good celebration at Dalmahoy, Edinburgh with everybody “cutting a rug” as trendies said fifty years ago, into the wee sma’ oors. Didn’t agree with some of the SCOTY choices but there you are, nothing new there. I might have put the Honda Civic R ahead of the Ford Focus RS and been in a quandary over the Best Crossover, Mazda CX-5 above the Range Rover Velar. Also I doubt the Mazda MX-5 beating the McLaren 570S Spider for Best Open Car. The Mazda’s worthy enough but juries somehow grow timid when faced with expensive cars. Looking elitist is not PC even though at £46,000 the Discovery is a lot more elite than the Dacia Duster elected two years ago. International Car of the Year never quite got over making the Porsche 928 winner in 1978. It imposed a “value for money” straitjacket that produced a string of losers starting the very next year with Chrysler-Simca Horizon. SCOTY class winners for 2017 were Suzuki Ignis, Ford Fiesta, Vauxhall Insignia Grand Sport, Ford Focus RS, Mazda MX-5, Volvo V90 Cross Country, BMW 5 Series, McLaren 720S, Land Rover Discovery, Mini Countryman, Mazda CX-5 and Skoda Kodiaq. Discovery’s distinction enabled it to be shown in livery of the Charity Air Ambulance (SCAA) Scotland’s rescue helicopter that can reach 90 per cent of the population inside 25 minutes. SCOTY and the ASMW supports SCAA and Jeremy Hicks, MD of JLR promised it a Discovery for six months over the winter. Able presenter at SCOTY Ally Ballingall is one of the helicopter’s dedicated fundraisers. Land Rover has always done well at SCOTY, Discovery 4 winning in 2009 and the Evoque in 2011. As a Life Member I am ineligible to vote so when the Dacia was selected I wanted to check out members’ opinion. For the first time in 60 years’ road testing however the Dacia press office turned me down. Apparently at my age it thought I couldn’t handle all that horsepower. Dalmahoy was the first SCOTY I can recall when Jon Zammett Audi head of PR didn’t collect an award. Autocar editor Mark Tisshaw said the other week that Audi is losing out to BMW and Mercedes-Benz. Its styling, he thought in a bit of a rut. Having just started paying good money for a new one I’m not sure. The first test car I ever got from a manufacturer was an Auto Union DKW 3=6 Sonderklasse during my National Service where they were made in Düsseldorf. Picture shows a not-very-military slouchy me driving it on the Nürburging. It was 1956 within a month of Jim Clark having his first ever motor race in Ian Scott-Watson’s similar DKW at Crimond. I have always had a soft spot for the four-ring symbol. Has Audi lost some of its grip? Maybe the cars are a bit bland and you can’t argue with the figures; it’s trailing behind Mercedes-Benz by 350,000 cars a year. BMW looks almost matchless for driving excitement and different Mercedes-Benz model ranges all look highly individual, unlike Audi’s severe uniformity. Full marks to Lincoln Audi. I’ve been in the business so long it’s not easy to surprise me. It is years since I actually bought a new car – almost all of those I’ve owned have been ex-press demonstrators or not exactly factory fresh. I expected to be taken out to the yard, given the keys and drive off. Not so. Turned up at the appointed time and nice young Liam Matthews, who brought round demonstrator after demonstrator and agreed that I should have quiet not-so-low-profile tyres, ushered us to a special room with a notice that said Welcome Mr and Mrs Dymock here is your new car. Not quite dry ice and a pipe band like SCOTY but a Big Event. Well done. It’s difficult to repress class status with cars. We were a Wolseley family. Decent middle-class, not racy like Jaguars or costly like Rovers. 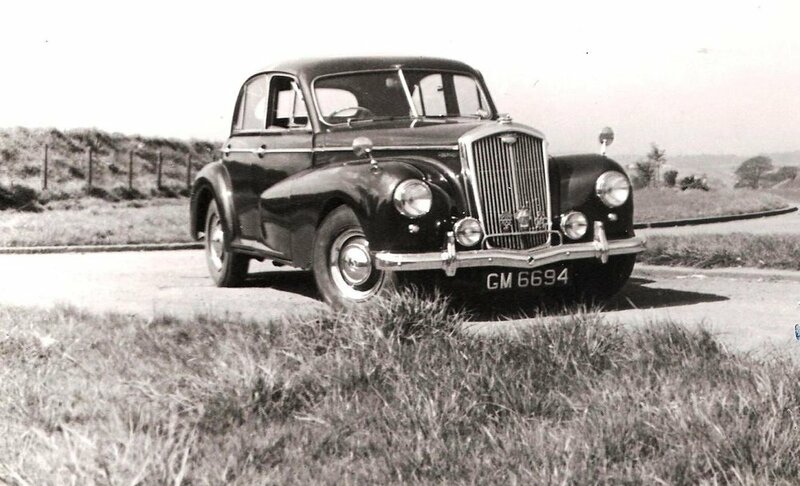 We moved to Armstrong Siddeley Sapphire and Vanden Plas Princess when it was the big woody-leathery one. One of the JLR executives at SCOTY was Brian Herlihy from Taggarts, Glasgow, with whom I used to arrange Jaguar and other press cars at Maryhill Road. He tells me the JLR bit has outgrown Maryhill Road and is moving to a bigger place. I reminded him and a colleague from Taggarts (Motherwell) that we got the family Wolseley 6/80 (below) from its Knowetop Garage. I never forgave service manager Chalmers complaining to my father the problem with the overhead camshaft engine was over-revving by teenage son, me. As Anders Clausager explains in his Wolseley, A Very British Car (Herridge 2016) the problem began with the Hotchkiss aero engine Wolseley built under licence in the First World War. It adapted the valve gear for cars; it was ingenious but expensive and 6/80s tended to burn out the hollow exhaust valves. The Police had a lot of 6/80s, which had to be modified with Stellite valves to try and cure the malady. Taggarts didn’t run to that so I got blamed. No justice in the world. Anyway Audis are like Wolseleys – not racy like BMWs or costly like Range Rovers. Well, not mine anyway.